Although most of the blood letting occurred in the environs of Thibodaux, the strike encompassed a larger area. The strike affected sugar plantations in St. Mary, Terrebonne ,and Lafourche parishes. These parishes make up an area known as the "sugar bowl." Thibodaux is the parish seat of Lafourche. 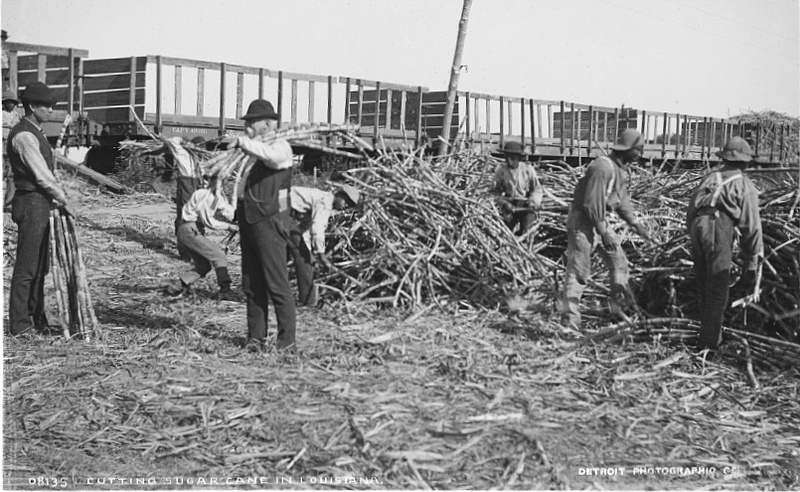 The plight of the sugar cane worker in 1887 was one of back-breaking labor and meager pay. Most field hands were paid approximately 13 dollars a month. They were also paid in script. Script was basically a coupon redeemable only at the company store owned by the planter. The store´s prices were normally marked up 100%. You can see that the worker usually wound up being indebted to the planter. Louisiana law stated that if a worker owed money to a planter he could not move off the planters land until the debt was paid. This law essentially reduced the plantation laborer to the status of serf. In 1885 the Knights of Labor was successful in organizing railroad workers who worked for the Charles Morgan Railroad and Steamboat company. The company owned a stretch of tracks that ran from New Orleans to Texas. The railroad passes through the communities of Des Allemands, Raceland, Schreiver, and Morgan City on its way to Texas. The K. of L. felt that the sugar cane workers were fertile ground to expand their organization. In 1886 a L.A.(local assembly) of the K. of L. was established in Schreiver, La. for sugar cane workers. It was the probably the first assembly of a labor union that allowed both black and white members to join. During a time when a strict caste system was imposed this was one hell of an achievement! In late October, 1887 LA 8404(Schriever local) presented a list of demands to L.S.P.A. The L.S.P.A.´s (Louisiana Sugar Producer´s Association), members included local sugar planters.The workers wanted elimination of scrip, a small increase in their daily wages, and payment every two weeks..The planter´s association rejected the demands The planter aristocracy ruled Louisiana at this point in time. They worked for many years to deny poor whites and blacks access to education, and better working conditions. They were not about to cede any of their power now. The Knights of Labor scheduled a strike to commence on the 1st of November 1887. The strike began during the crucial harvest period known as "grinding." On November 1st workers in St. Mary, Lafourche, and Terrebonne parishes refused to work, and refused to vacate their cabins that were plantation-owned. Attempts to evict tenants by local sheriffs were unsuccessful. The sugar planters were faced with the possibility of losing their crops to a freeze if the strike persisted. On the same day the strike began, the planters association called on the governor to send them help in the form of the state militia. Governor McEnery(1881-1888) who was himself a plantation owner had no problem in ordering the state militia to the embattled region. The first militia companies arrived in Schriever, Louisiana from New Orleans on the first of November. They made the short trip to Thibodaux where they intended to store their epuipment which included horses, rifles, and a Gatling gun in front of the Lafourche parish courthouse. The courthouse is a beautiful antebellum Greek Revival structure which still serves as the parish courthouse to this day. The two militia companies that arrived in Thibodaux were not the only ones to take part in strike-breaking. Other companies were sent to Houma and Lockport. Some 10,000 plantation workers took part in the strike. Most of the strikers were black, but nearly 1000 were white. The militia companies sent to the region worked with local judges in evicting strikers from plantations, and provided protection for "scabs" sent in to replace the strikers. When striking plantation workers were faced with soldiers armed with Springfield rifles they offered little to no resistance. They heeded the orders to leave the plantations. Many congregated in the black section of Thibodaux. Problems arose when white scabs were fired upon in Terrebonne parish. Strikers, who were forced off plantations, were believed to be involved in firing into sugar mills in Lafourche parish. Pickets were placed in around the city of Thibodaux. The "pickets" were composed of white civilians from Thibodaux, and neighboring parishes. They were no doubt horrified by the rumor spreading around town that black strikers intended to burn the city down. The struggle came to a head when two white picketers were fired upon while at their posts in a black section of town. The two picketers survived, but the incident enraged the white population of Thibodaux. White vigilantes rode through the neighborhood firing their weapons and wreaking havoc. The strike had degenerated into a race war. Striker´s and their family members were rounded up by vigilantes. Many were told to "run for their lives", before being summarily executed. On the morning of November 23, 1887 anywhere between 30 to 300 black strikers were killed. A company of militiamen known as the Shreveport Guards is considered to have taken place in the massacre. Another attempt to organize sugar cane workers in southeast Louisiana would not occur until the 1950´s. I have lived and worked in the area, and never heard of this account. The Knights of Labor were never successful, due to the fact, they tried to organize unskilled laborers. However, I applaud their efforts in trying. This had nothing to do with race. It was economic. There are no KKK members in this area. It tells the story using eyewitness accounts that have never been seen before.